Remember Pioneer Chicken folks? Oh man I can still taste that chicken. Why did they go they were doing fine at least the one I used to go to in Orange on Tustin Avenue? They to me were as good as Kentucky Fried Chicken and different taste. And then a favorite Family restaurant also one Spoons also on Tustin Ave. Once upon a time. Sad. "Pioneer Chicken, (or Pioneer Take Out, as it is officially named), is an American fried chicken restaurant which was founded in the Echo Park area of Los Angeles in 1961 by H.R. Kaufman. When Kaufman sold the chain in 1987, there were 270 stores operated by 220 franchisees. During the 1970s, several locations operated in Honolulu on the island of Oahu, Hawaii. There are three locations remaining in Los Angeles. It was named after Pioneer Market, a now-defunct small chain of supermarkets in Los Angeles. The original location in Echo Park was located next to the 1980s era Pioneer Market (the original 1932 market having been torn down in the 1980s) and is (now a Walgreens Pharmacy) on Echo Park Avenue and Sunset Boulevard. Due to considerable redevelopment activity in the neighborhood caused by gentrification, it was shut down in March 2009. During the 1980s, Los Angeles Lakers announcer Chick Hearn and former football player O.J. Simpson used to advertise for the restaurant." 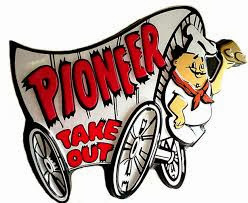 Did your family eat at Pioneer Chicken? Do you remember the O.J. Simpson ads? My brothers first job was at the Pioneer Chicken in Tustin.